Don’t roll the dice on LVS stock. Use this to gain a trading edge instead. Casino operator Las Vegas Sands Corp. (NYSE:LVS) lost big Thursday. The question is, is it time for investors to wager on green, red or simply leave the betting to others? Let’s examine what’s happened off and on the LVS stock chart and offer an odds-on favorite for a trade. It has been a while since blame on investor losses in U.S. stocks were fingered at China. Late Thursday that changed for LVS and publicly traded gaming outfits Wynn Resorts, Limited (NASDAQ:WYNN), and MGM Resorts International (NYSE:MGM), which have exposure to China-controlled gaming haven Macau. Chinese authorities announced it will be imposing a daily ATM cap on UnionPay Co. customers in Macau beginning Saturday. The limit drops the current ceiling on withdrawals from approximately $1,150 USD to $626 USD. Shares of LVS, along with Melco Crown Entertainment Ltd (ADR) (NASDAQ:MPEL), has the most exposure to the island’s gaming revenues and piled up a quick afternoon loss in excess of 12.75%. Hong Kong-based Melco was the hardest hit, down 13.71% on the session. The new initiative by Chinese officials follows a couple difficult years for LVS and the other casino operators as Macau’s gross gaming revenue is only now rebounding following corruption and money laundering crackdowns. For its part, China is hoping to help control its currency amidst mounting depreciation pressure and control known capital outflow abuses through Macau tied to a few bad actors using UnionPay Co. illegally. But what does the new rule mean for LVS investors? According to Bloomberg, China UnionPay Co. cards are used by roughly half of mainland Chinese gamblers in Macau. As much, Thursday’s action is not entirely a small matter. At the same time, most customers still, simply won’t be affected by the new withdrawal limit. Now the mandate means even less. Overnight, Thursday’s bearish driver in Las Vegas Sands was softened. Chinese officials announced the new limit rule on ATM withdrawals is a per transaction ceiling. The daily limit it turns out, has not been affected. In early Friday trade, LVS stock is up about 3.75%. Suffice it to say, impulsive acting during a minor panic appears even more questionable now. I’m looking at the LVS weekly price chart, and I think it makes sense to take the other side. Click to Enlarge It’s been a good year for Las Vegas Sands investors. Thursday’s carnage aside, shares of Las Vegas Sands are up about 29% and more than 2.5 times the S&P 500. The better news for LVS is there’s no overwhelming technical evidence that trend is close to be finished either. Looking at the weekly price chart of LVS stock and following a fairly stiff two-year long corrective move into key support, shares have been trending higher within a newly developed up-channel. Admittedly, on the daily perspective (not shown), Las Vegas Sands appears to be in freefall. But zone support is nearby. 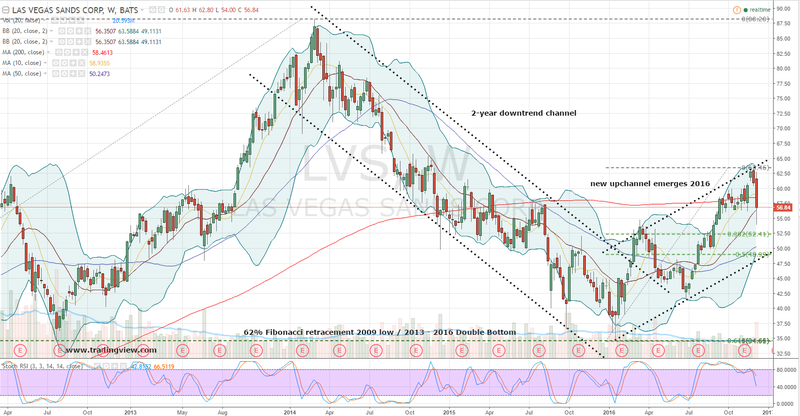 From $48.50-$52.50, LVS offers bulls the 38% and 50% retracement levels, a 200-day simple moving average and an up-channel support line. LVS stock might be a bit of gamble for bulls at current prices, but with fairly staunch technical backing not too far below … it’s time to wager. Based on what’s been presented, the Jan $52.50/$50 bull put spread looks attractive. The vertical is priced for a credit of 50 cents with LVS at $56.75. In selling the spread the bullish trader can capture the full credit if LVS holds above $52.50 at expiration. That’s a margin of safety of 7.5%. The January contract also expires prior to earnings. Earnings can be a dicey affair, so we don’t mind sidestepping it. Failing the capture of the credit, the trader limits his or her risk to $2 per spread based on the 50-cent trade price. Aside from being in full control of one’s risk exposure, LVS would need to plunge another plunge of 12% from current levels and test the upper boundary of our discussed technical support area. What are the chances of red continuing to come up in LVS stock? Your guess could be better than mine. But if conditions do get worse, the trader is in position to purchase LVS for no worse than $52 through assignment or adjusting. As an alternative reality to collecting 50 cents of more immediate income, that still sounds like a longer-term, winning proposition. The information offered is based upon Christopher Tyler’s observations and strictly intended for educational purposes only; the use of which is the responsibility of the individual. Mr. Tyler currently holds no positions in any of the securities discussed in his personal or managed family accounts but may initiate, for better or worse, a position in two or more business days following the publication of this article. 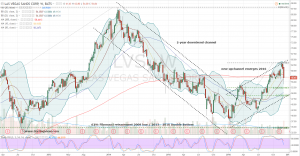 Article printed from InvestorPlace Media, https://investorplace.com/2016/12/las-vegas-sands-corp-lvs-stock-smart-bet/.